Franz Hartmann was born in 1907 in Berlin. 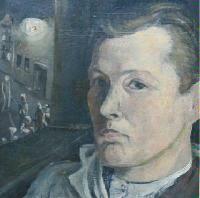 In the 1920ies he studied at the Vereinigten Staatsschule fürfreie und angewandte Kunst in Berlin at the painting class of Prof. Ernst Böhm and enamel technique at Prof. G. Hilbert. His first enamel works date from 1927. In 1937 Hartmann exhibited an enamel casket of his at the World Fair in Paris and was awarded a gold medal for the piece. At the Triennale Milano he gained a gold and a bronce medal in 1940 and 1951. After the war, Hartmann taught at several universities and schools in Berlin and finally became Professor in 1970 at the Staatliche Hochschule fuer bildende Kunst, Berlin. Franz Hartmann died in 1989 in Berlin.